This is simply the best book of criticism on Kafka's thought and work ever written. Franz Kafka (1883-1924) has come to be one of the most influential writers of the twentieth century. The Myth of Power and the Self brings together Walter Sokel's most significant essays on Kafka written over a period of thirty-one years, 1966-1997. This volume begins with a discussion of Sokel's 1966 pamphlet on Kafka and a summary of his 1964 book, Tragik und Ironie (Tragedy and Irony), which has never been translated into English, and includes several essays published in English for the first time. Sokel places Kafka's writings in a very large cultural context by fusing Freudian and Expressionist perspectives and incorporating more theoretical approaches—linguistic theory, Gnosticism, and aspects of Derrida—into his synthesis. This superb collection of essays by one of the most qualified Kafka scholars today will bring new understanding to Kafka's work and will be of interest to literary critics, intellectual historians, and students and scholars of German literature and Kafka. This is a gathering of dense, rich essays on Kafka spanning four decades, produced from a relation of affinity between critic and author that may be without parallel in recent criticism. Sokel reads Kafka with so assured an understanding and with such an acknowledged accomidatingness to alternative readings that it is almost impossible to speak of its errors...This is simply the best book of criticism on Kafka's thought and work ever written. Since Sokel's critical masterwork, Franz Kafka: Tragik und Ironie, has never been translated into English, The Myth of Power and the Self, a rich expansion of the first book, becomes without question the indispensable work on Kafka for the American reader . . . . The writing is muscular, deep, and lucid; it is a joy in itself and a provocation to much new thought. Every reader interested in modern literature will find fascination and profit, logic and charm, in these trenchant essays on Kafka's genius. [This is] a volume that is undoubtedly destined to become a standard work of Kafka criticism. The author writes with all the authority deriving from a lifetime's fascinated involvement with Kafka work. Professor Sokel's new book not only presents a broader perspective, but also modifies and differentiates some of his former positions. He makes excellent use of new theoretical thinking but the focal point of his deliberations remains always the literary text. This elegantly written new book demonstrates an impressive combination of analytical and interpretative skills which will inspire Kafka scholars and Kafka readers alike. If Tragedy and Irony is the start of any good Kafka library, it is clear that The Myth of Power and the Self is the other bookend. Like all of Walter Sokel's previous scholarship, The Myth of Power and the Self is the product of rich erudition and acute interpretive insight; it is destined to become a standard of literary criticism, read with profit and enjoyment by scholars and students alike. The world's most eminent Kafka scholar selects essays from important phases of his life-long critical dialogue with Kafka's myth. They show his deepening understanding and continuous efforts of re-reading Kafka's texts, at the same time integrating and evaluating new research. Three new essays complete a volume which is as indispensable as Sokel's prior major trail blazing study Tragik und Ironie. Walter Sokel's productive relationship with Franz Kafka may be unique in the history of criticism. 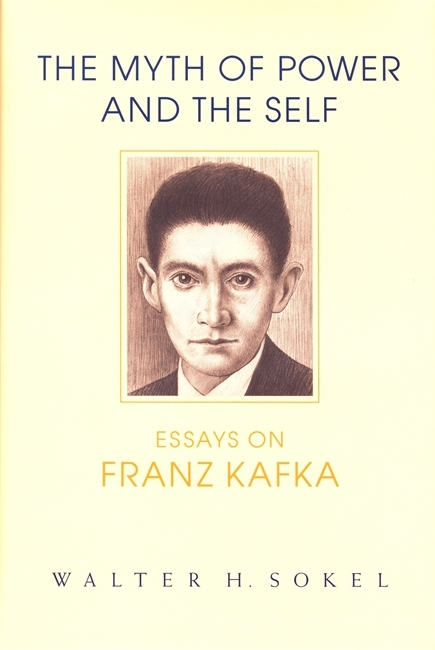 The Myth of Power and the Self is astoundingly comprehensive, a record of the precise ways in which a great writer like Kafka is always both inside and just outside our daily life. Sokel's argument-that Kafka articulates the core Western ambivalences about individualism and the power-drive-is peculiarly relevant to the present seismic historical shift.